I think it was Tali that planted the seed when she posted about some lovely new flats from Zara on her fashion blog. I made a mental note to have a look for these on my next visit to the store. Well I did in fact find them - but not in my size. I didn't give up there though. No sir! I wandered around the store admiring some of the amazing stock they have in there at the moment and then my eyes spotted this pair in the TRF section. 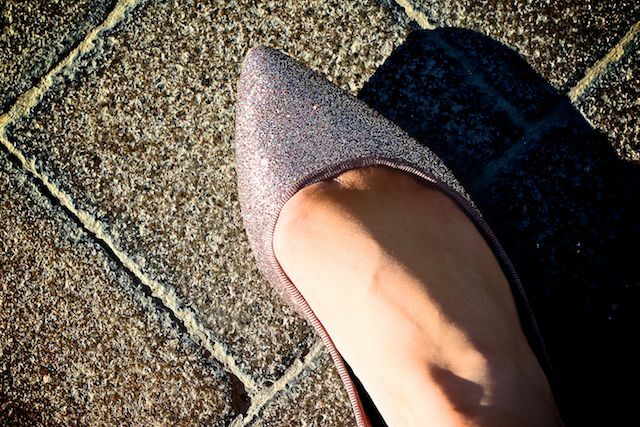 A pointed toe and a pink, mauve-under-toned glittery flat at a good price? Yes please. I loved how these looked under the store lights. It was sort of mesmerizing. In indoor light they come out a true pink - outdoors they take on an icy/mauve and slightly surreal look. I wore them today and constantly admired how they looked in the sunlight. The sparkle factor was obnoxiously high. I paired them with a standard combo that you have seen before - an ASOS dress I got this summer and an ASOS blazer (now reduced...ugh hate that. I paid full price - Link!). The only bad part of this story is that they were not feet-friendly. It's fair to say that the back of my heel was crying by the end of the day. It was so bad that at one point I concocted a sort of flat footed walk that would avoid shoe-heel aggravation. Not chic but very, very necessary. Link to the shoes here - Link! - and they are £19.99. Hope you all had a great Friday! 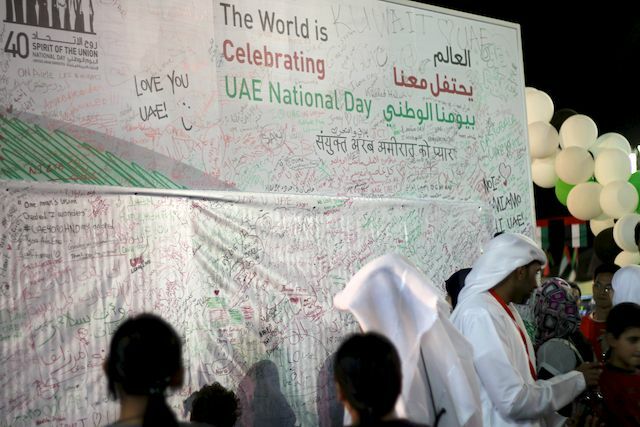 It was National Day in the UAE today with the country turning 40. This means lots of public events and lots of patriotism emblazoned on everything from buildings to cars. I have never seen anything like it. The cars are the stars of the show. 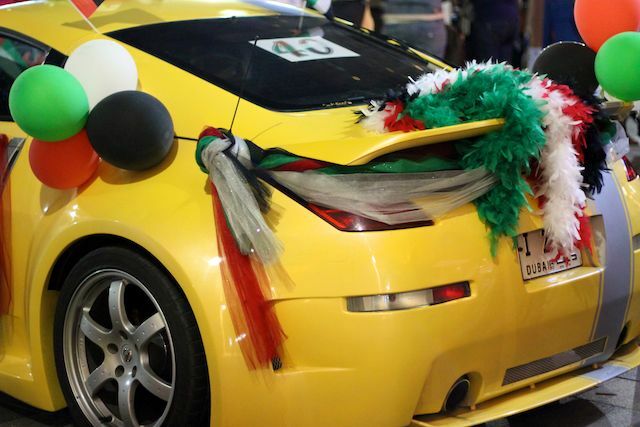 Emiratis go to extraordinary lengths to show their allegiance. 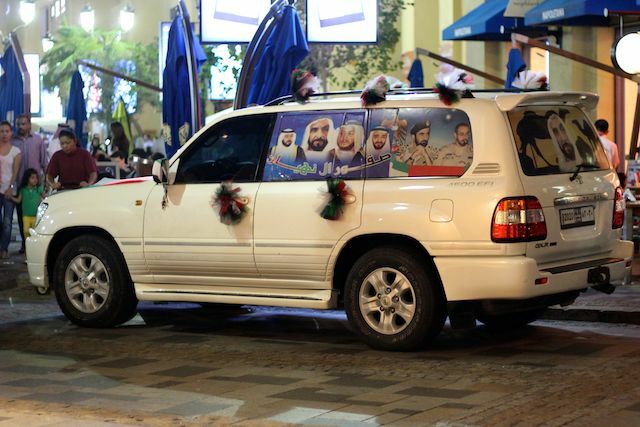 Think crystals on BMWs and Range Rovers, giant flags and laminates of the various UAE Sheikh's on the windows and windscreens. @Katie - haha I know! That's some serious national dedication right there. nice flats! what a pity they are painful, but i find that almost any flat shoes from 'cheap' places like h&m or zara are like that! what a shame! @The Pampered Sparrow - that's what surprised me. I know the country is young but only 40! They have achieved a lot in that time. I feel your heel pain. Been there too many times myself! Beautiful shoes and outfit overall!! Love the sparkly shoes, you could argue they're an even bigger bargain as they have an indoor look and an outdoor look, or am I taking justifying shoe purchases slightly too far? Sometimes the prettiest shoes are the most painful, but we endure because it is worth it ;) Get the blister block out! wah it's like someone painted these flats with mad as a hatter by opi, looove! P.S. i smelled voyage d'hermes today and it's bleeding amazing, omg it's like gin tonic in perfume form, i need it! Ooo those are pretty!! Great find! I think I would put up with the pain too for shoes that gorgeous, and the price is really good too. Especially for Zara! l love those flats- and your taste in clothing, accessories, and make-up really! I love those shoes, my favourite shoes completely demolish my heels every time I wear them but they're so pretty that it's worth the pain. Damn that Lambo looks insane. Lol those flats are fabulous! I'd take a bullet for some sparkle. I love that ASOS dress - so pretty and a gorgeous colour! 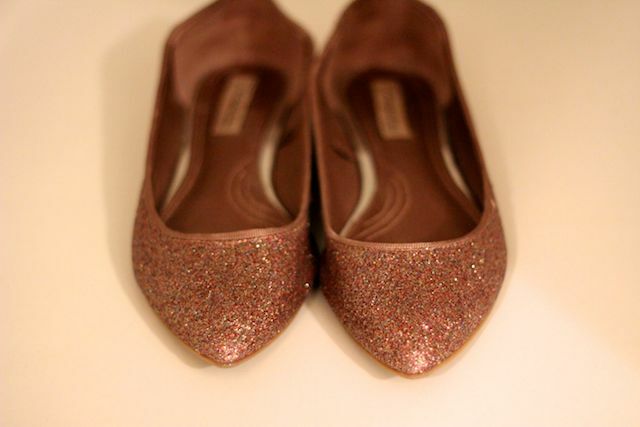 Those glittery flats are perfect. Ouch but they are so pretty. You don't see that many pointy flats around. These are gorgeous. As for your Asos jacket and dress, what a combo! 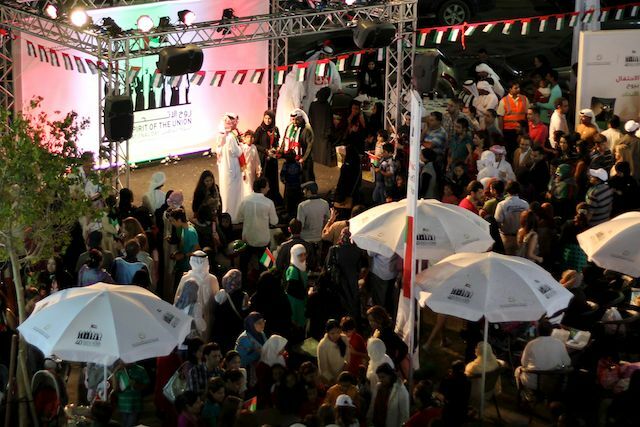 They work so well together Hope you enjoyed National Day! Great pics as usual! 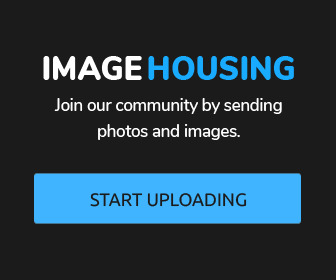 Love your photographic eye! I love your simple yet chic outfit, the shoes definitely add fun and girlyness to it! How are you going to make them more comfortable? I'm curious to see what you do. Usually I add bandaids to areas where it hurts, but sometimes it doesn't look that nice 'cause it's peeking out. Those shoes are incredible! I'm such a sucker for anything sparkly. I love your style..simple but stylish! They are my perfect festive shoe, you don't understand how devastated I am to hear that they are viscous...or perhaps you do. I love the ASOS blazer!! i've seen some really similar shoes in h and m. and i've been eyeing that asos blazer for a while now- just wish they had a petite version. I love those shoes, especially the colour, so so pretty! I've always wanted to visit Dubai, looking for an excuse to go! Narrowly missed an opportunity when the business school I attend sent some students over there to work in the air show. I loveee yourr sunglasses ! May I ask what model they are ???? Lovee yourr blogg too ! The colour of them outside is wonderful. Ahh if only my look could be as put together as yours, I'm a little green eyed monster. I bought a pair similar the other day! I was drawn in by the shiny sparkles. They are probably the most uncomfortable pair of flats that I own..but they're just so cute! i wish i was somewhere in the world where i need sunglasses ! jealous! 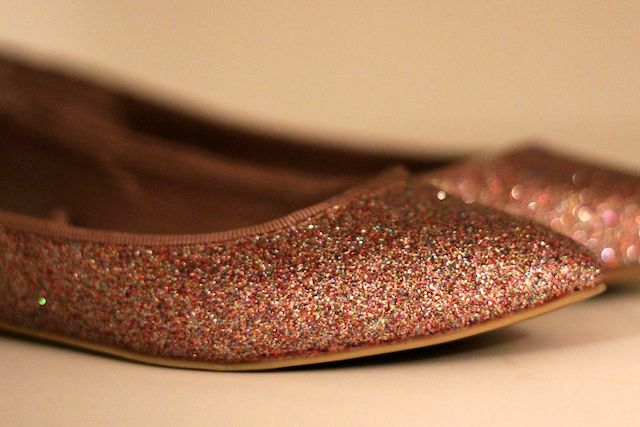 The kid's section of Zara has some fabulous sparkly ballet pumps - those are softer and more 'foot friendly'. Looking good thought Laura!!! Love that blazer - getting it now! Such a useful blog wow, you have defined everything perfectly. Cheers!! I have enjoyed a lot your post, that’s really superb. Hi to everyone, I am sure you all will be enjoying this post like me, because it has superb details and facts that can never be ignored!